Shinhan Bank CEO Wi Sung-ho, who recently failed to clinch his reappointment, publicly let out disappointment and shock over his replacement decision, indicating at possible leadership strife within the financial holding group. “I feel baffled by the unexpected notice,” Wi told reporters Wednesday. While claiming to have had “no idea” over the sudden personnel decision, Wi said he shall for now refrain from further comments for the sake of organizational stability. 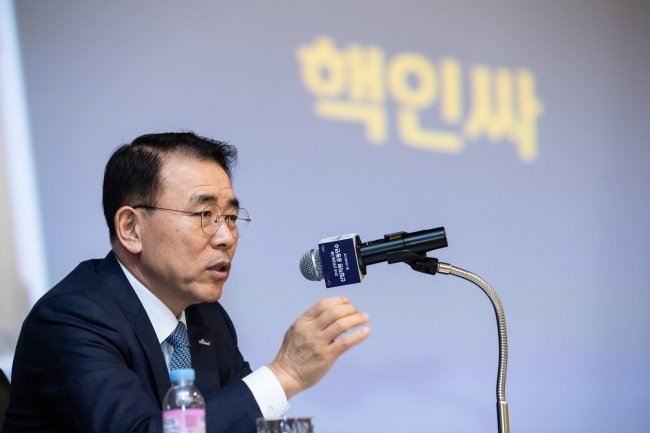 Last week, Shinhan Financial Group Chairman Cho Yong-byoung decided in a board meeting to nominate new chief executives, including Jin Ok-dong for Shinhan Bank and Kim Byung-cheol for Shinhan Investment. The nominees are slated to take office after their nominations obtain approval at a shareholders meeting in March. The announcement came as a surprise, as the two incumbent chiefs’ terms are due to expire in March, with Wi having largely been anticipated to bid for a second term. Wi’s remarks led to speculation that his replacement may reflect the power struggle within the group, as Chairman Cho also faces reappointment next year. “No one can tell what has really happened, but what is for certain is that four out of five CEOs have been ousted,” said an industry observer on condition of anonymity.